← How much attention will Mental Illness Awareness week get? Mental Illness Awareness Week is October 4th thru 10th, 2015: What can you do? Mental Illness Awareness Week started in 1990. 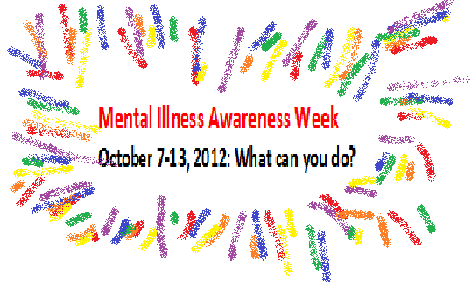 What can you do to help raise awareness of mental illnesses and stomp out the stigma that still exists today? 1. Contact someone you know who suffers from a mental illness and let them know that you appreciate them and/or how they have fought the fight they fight. Thanks to Governor Deval L. Patrick for declaring October 13th Mental Health Awareness day in Massachusetts. Connecticut’s Department of Mental Health & Addiction: Mental Illness Awareness Week 2012. SAMSHA: How many American Experienced Mental Illness in the past year? A list of blogs and articles can be found at: Blog Directory , Bipolar Disorder Blogs , and Top 10 Mental Health Blogs , Websites on Mental Illness . Note: You can google mental illness or a specific mental illness (ex. schizophrenia, bipolar disorder, borderline personality disorder, depression, etc.) You can also search under these key words on Twitter of Facebook. Stigma of Mental Illness: Do you think it’s getting better? 9. Walk in a walk-a-thon for Mental Health Awareness week. If you know of any other ideas, please comment or email me at bipolarbandit@hotmail.com. Thanks! This entry was posted in Uncategorized and tagged Bipolar Bandit, bipolar disorder, bipolar_bandit, borderline personality disorder, depression, Depression: A Global Crisis, letter to editor, media, mental illness, mental illness awareness week, politicians, PTSD, schizophrenia, World Mental Health Day. Bookmark the permalink. 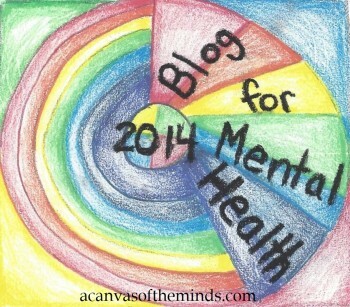 5 Responses to Mental Illness Awareness Week is October 4th thru 10th, 2015: What can you do?